The mystery ship that shot Cudley docks inside Maligna’s hive mothership. The pilot reports his success, and as a reward, the alien queen bites and kills him. Meanwhile, Jagwar recognizes Cudley from stories he had heard from Michaelangelo. Just then, Leatherhead, Wingnut and Scewloose come over a hilltop and warn the others to back away from their friend Cudley. 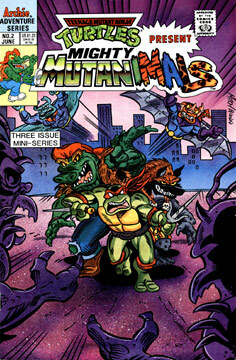 Before Dreadmon has time to comply, Wingnut attacks him, and a fight breaks out between the two groups of Mutanimals. Cudley is slowly recovering and yells at them to stop fighting each other and to foucs on their common enemy – Maligna’s minions. Null and Kid Terra are onboard Skul and Bean’s ship, which is traveling through space to meet up with the hive mothership. Kid Terra spots Raph and Mondo Gecko hiding onboard – but mysteriously, he does nothing about it. After the ship lands inside Maligna’s vessel, the villains take their leave. As they disembark, Kid Terra gives the “thumbs up” signal to Raph and Mondo. The mutants wait until the coast is clear and then set out to do what they can. Raph hatches a plan after they find an exoskeleton graveyard left from dead alien soldiers – the two disguise themselves as Maligna’s warriors by wearing the insectoid exoskeletons as armor. Unfortunately the pair couldn’t disguise their smell, and they’re immediately discovered. A fight breaks out, but our heroes win easily. As they drag the bodies of their defeated adversaries into hiding spaces, Mondo and Raph are unaware that Maligna herself is stalking them. Back on Earth, Ray Fillet and the other Mutanimals investigate weird pods that are hanging from the limbs of the few trees that weren’t devoured by the larvae. Screwloose insists on burning the pods before more aliens hatch, but Leatherhead and Dreadmon don’t like the idea, as it would be dishonorable to kill a foe in their sleep. Screwloose gets angry and he and Wingnut fly off. The remaining Mutanimals build a campfire, and as the evening pases, they tell one another their origin stories. Once morning arrives, Wingnut and Screwloose return, with a horde of bats accompanying them. Unfortunately, the pods have now hatched, and the mutants face a fresh army of insect warriors. On Malgina’s ship, the vile queen easily captures Raph and Mondo as her vessel approaches the Earth.